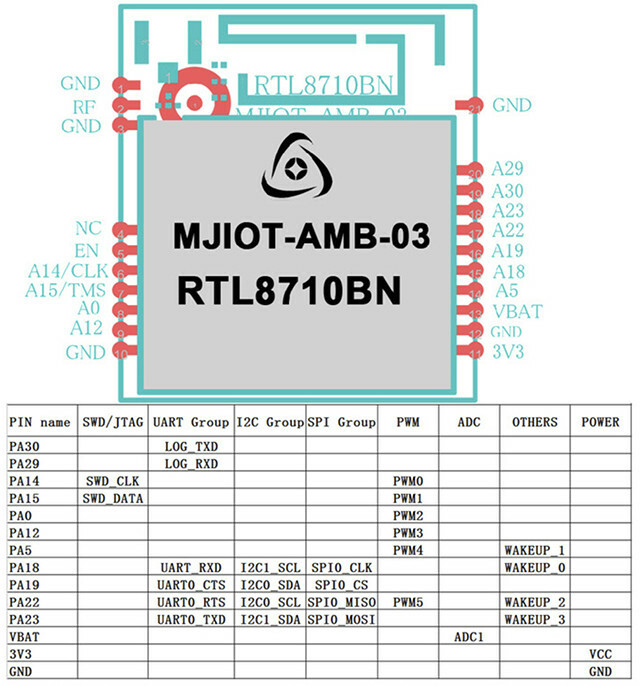 We’ve already covered Realtek Ameba ARM Cortex M3 WiSoC several times with their RTL8710AF, RTL8711AM and RT8195AM solutions, but the company has now a new “Ameba Z series” relying on an ARM Cortex M4 core starting with RTL8711BN MCU. AFAIK, other Ameba MCUs do not support XIP, but RTL8710BN and this lowers memory requirements since code can be executed from storage. 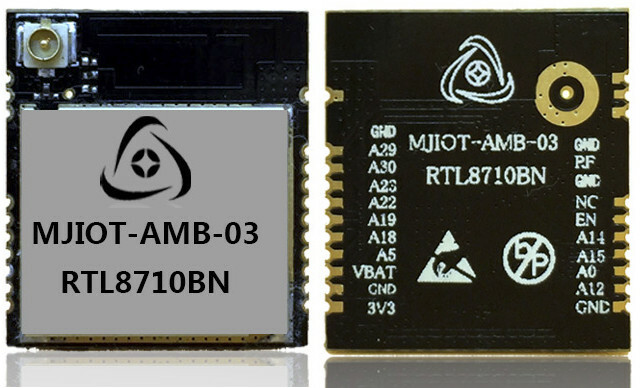 MJIOT-AMB-03 module – pictured at the top of this post – is the first module based on RTL8710BN, supports up to 128 MB external flash, and includes a PCB antenna, and an u.FL connector. Power consumption is said to be 2.5 mA during operation, and 70 uA during sleep (@ 3.3V?). The module can be made to interface with cloud services such as Ailink, Joylink, QQlink, Hilink, Gagent, and Weichat. You can find a longer list of hardware parameters here. 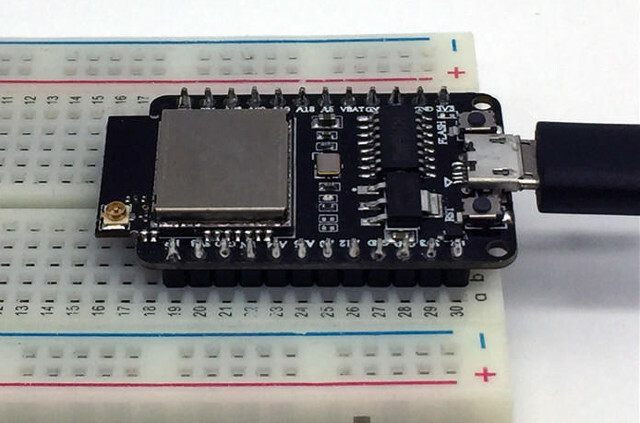 The module can also be found on MJIOT-AMB-03-DEBUG, a breadboard-friendly board with a micro USB port, two buttons, and a JTAG/SWD header. The module used to be sold for $1.98 and the board for $5 on eBay, but the listings have expired. However, some RTL8710BN items are still for sale on Taobao with a 5 CNY ($0.725) adapter board for MJIOT-AMB-03 module, 13.30 CNY ($1.93) for the module itself, and 30 CNY ($4.35) for the development board. Shipping (to China) adds 8 CNY ($1.15). However, you can’t do much with an SDK, and kisste, who has been deeply involved in Ameba solutions (see VGA on RTL8710), found out that this module requires a newer Ameba SDK, and that Ameba SDK 4.0A without NDA had just been released with support for RTL8710BN / Ameba Z series MCU and mbedTLS. If it contains an FPU, you should call it an “M4F”. Realtek website only reports Cortex-M4. Other websites also show Cortex-M4 but mention FPU capabilities for the module, while one Chinese source with more detailed specs shows Cortex-M4F. So maybe I’ll add a TBC in the specs. Is it me or the “BP” logo should read “pb” instead ?